Seaside Furniture of Toms River, the store profiled in the Bamboozled column earlier this week, has done the right thing for its customer. Nancy Sheridan had purchased thousands of dollars of furniture to replace pieces that were lost from her Ortley Beach home during Superstorm Sandy. What followed was a dispute over the return of two items that Sheridan said a store employee had approved. Sheridan said she learned there was a problem when the store refused to deliver pieces from a subsequent order unless Sheridan paid the balance — a balance that didn’t include the refunds for the items she didn’t take. In all, Sheridan believed she was due a refund of $1,117.99 from the first order, Sheridan said. After failing to solve the dispute, she asked for Bamboozled’s help. We reached out to the store employee, Jamie Ulrey, and over the course of five days, she didn’t respond with any answers. On the fifth day Ulrey she said she was in a meeting, but promised to call when it ended. She never did, and our publication deadline was up. Several orders and returns have led to a dispute over a refund and the balance due. That was a Friday. Over the weekend, we emailed Ulrey to remind her the story was running on Monday. She said there were no cancellations on special orders. We reminded her of the conversations Sheridan said they had, and of the handwritten document that indicated the customer would be refunded for the mattress and the steps, less the restocking fee. Ulrey said she was mistaken about accepting the return of one item. When asked about the second item — a mattress that wasn’t on the truck for delivery so it wasn’t received by the customer — she said she had no additional comments. On the day the column ran, Ulrey emailed again. Later that day, we spoke to Seaside Furniture owner Izzy Lindner. Lindner said he didn’t know anything about the dispute or our attempts to contact the store until the story was published. Then Lindner shared a surprise. 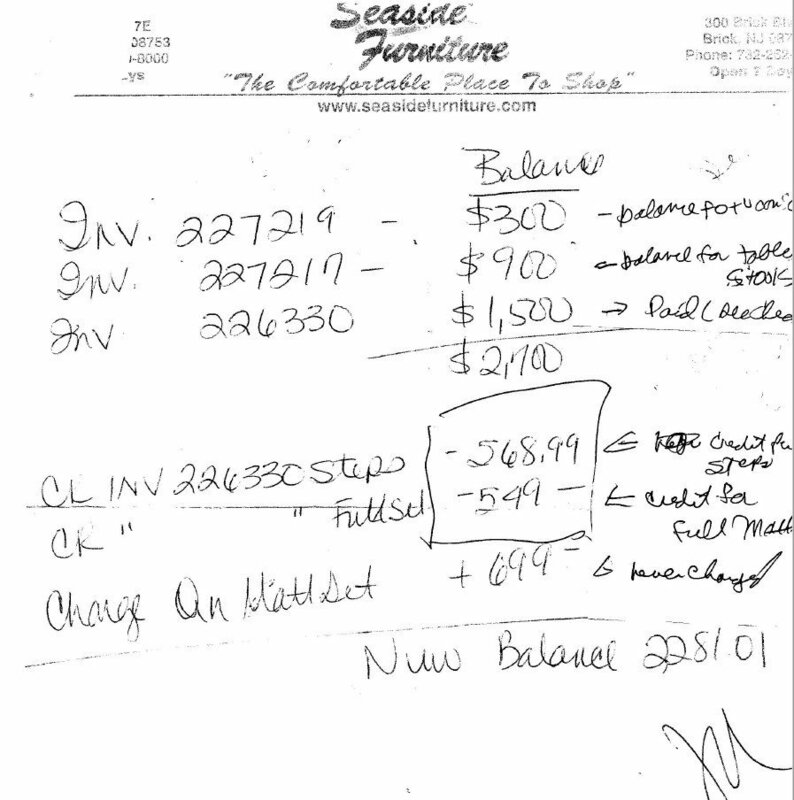 Seaside Furniture filed suit against Sheridan in Ocean County before our story ran, saying Sheridan owed the store money. “But that’s not my goal,” Lindner said. We went over the invoices and the payments. In the end, Lindner agreed to credit Sheridan for the items as long as she’d pay the remaining balance — $82.01 — and take delivery of the remaining items. We also asked him to pull his lawsuit. He said the court date was for Oct. 19, and instead of withdrawing, he would simply not show up for the court date, saying it would then automatically be dismissed. We reached out to Ocean County Vicinage to make sure that’s how it works, and the rep said yes. If the store doesn’t show, it would be dismissed. But the rep recommended the store instead file a “Notice of Dismissal,” which would ensure all the parties that no further action would be taken. We followed up with Seaside Furniture to request it officially dismiss the case. Lara Lindner, Izzy’s daughter, said the company called the court and cancelled the legal action against Sheridan. We also offered Seaside a chance to share additional comments with our readers. “In order to bring closure to this situation, we have agreed to go against our store policy and work out any remaining issues and discrepancies directly with Mrs. Sheridan,” she said, noting the company will go “above and beyond” to satisfy the customer. We asked about Sheridan’s claims that Ulrey agreed to the returns. Sheridan was happy with the resolution. She confirmed Oct. 10 as the new delivery date, and she said she confirmed the remaining balance owed.